This is an edited re-post. 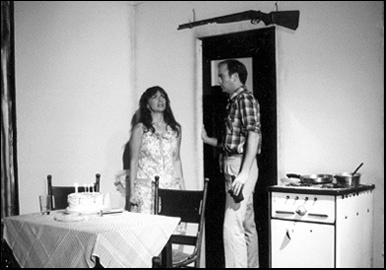 Cecil, Virginia, 1964, was the second play I wrote and the first one produced by the Baltimore Playwrights’ Festival, in August, 1985. The story was based on the murder of my maternal first-cousin, Phyllis Jean. While there are positive things to say about the production, it failed my own expectations. I had hoped that writing it would somehow deepen my insight into the murderer, help me understand what drove Phyllis Jean’s husband to kill her. I was convinced that a fictionalized version of the deed would free me from thinking about it—or him—ever again. But some critics said that the play was too much a portrait of life in a small town, rather than of the murderer and his motivations. The reviews, good and bad, only compounded the emotional confusion I still felt. In a case of tragic serendipity (cosmic joke?) the actor cast to play Joe Pete, the wife-killer, would murder his real-life wife a few years later. And in an even stranger alignment of dark stars, the woman he killed was a co-worker/friend of mine, her office no more than a hundred yards from my own. 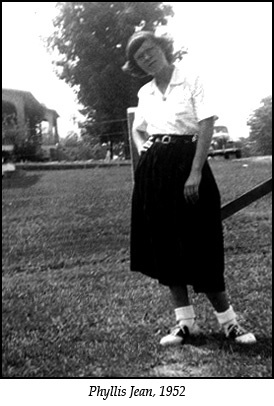 His wife was no tomboy like Phyllis Jean, and she didn’t have my cousin’s red hair and freckles, but she was vivacious and witty and fun to be around. And she had a lovely smile. In those ways, and in her fate, she came to remind me very much of Phyllis. Here are a few lines from Act One, Scene One, beginning with a stage direction. We hear a typewriter. Lights up in the office of the Cecil Herald. ASHER, who has a small town businessman look about him, is using his index fingers to tap out a story. After a few beats KITTY struts in. She is a small woman, pretty, light makeup, flowing red hair, the toned body of a dancer. ASHER (mock-stern): Kitty, give it. KITTY: Lordy, what is this? KITTY (curious): What for you reckon? ASHER (ignoring the question): Kitty, please, I’ve got this deadline—and a headache. Many who saw the play agreed that my female characters were well-written, “for a man.” Any skill I may have for writing from the female POV is likely because as a young boy I spent a lot of time listening to women in all kinds of settings. 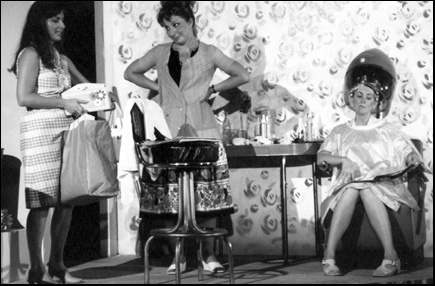 My favorite half-sister ran a beauty parlor, and when she had to baby-sit me on a workday I’d tag along. I loved to watch and hear the women sitting under the hairdryers, flipping through Look and Life and Collier’s, gabbing about this and that, appearing at once cute and serious and silly in hair curlers—talking, talking, talking. Aside from the reviews (brickbats included), the fun of hearing actors say my words, and experiencing how a play is staged, the BPF production was my reward for months of hard work. But the nagging fact remained that the murder, as written and staged, happened out of the audience’s sight and was, as one critic said, “. . . the off-stage fulfillment of (an) ominous promise (and) so perfunctory we are cheated of pathos. Perhaps the playwright wanted us to see the play’s climactic event as just another news item in the Cecil Herald. Still, murder is not a subtle crime. It calls for more than suggestion.” That critic had me pegged. While the play was an OK first effort, I came to agree that Phyllis Jean’s death needed to be—deserved to be—dealt with directly. And, because of my inability (unwillingness?) to face it at the time, I had hidden it off-stage. As serendipity would have it, though, I’d get a chance to try again. More about that soon, when I post Bad Actors II . . . This entry was posted on Saturday, February 28th, 2015 at 4:52 am and is filed under acting, actors, art, audience, characters, composition, couples, crime, critics, culture, death, domestic conflict, drama, essays, family, fiction, friends, kids, love, marriage, memoir, men, playwriting, quotes, relationships, theater, women, writing. You can follow any responses to this entry through the RSS 2.0 feed. You can leave a response, or trackback from your own site. In addition to the strange and spooky aspect of life imitating art imitating life (there are actually four cases of husbands killing wives, if you count the story that Asher is typing up in the first scene of the play), this essay causes the reader to ponder how difficult it is to work out our deepest feelings in writing. If we come at them obliquely, as you did in the play, we risk diluting the dramatic arc the audience is expecting. And if we come at them directly, it seems (to us at least) exploitative, self-serving, and heavy-handed. You might have been ahead of your time (and/or in good company) in using a critical event as a means of examining a particular culture at a particular place at a particular time in history (“Cecil, Virginia, 1964”). Who cares if the murder takes place off stage? Your watching and listening have served you well. This is a wonderful comment, Flo—generous, thoughtful, lovely in its length—and it demands a thoughtful response. The problem is at the moment I’m at a loss for the right words. But I’ll think of something. And in any case, I’m pretty sure that Bad Actors II, the essay that I was working on this evening and plan to post very soon, will address some if not all of your insightful points. And of course my hope is that other readers will follow your lead . . .